NEW YORK (AP) All over baseball, rookies are making quite an impression – Shohei Ohtani, Ronald Acuna Jr., Gleyber Torres and more. On Sunday, the New York Mets and their fans saw a glimpse of what Amed Rosario might bring someday. 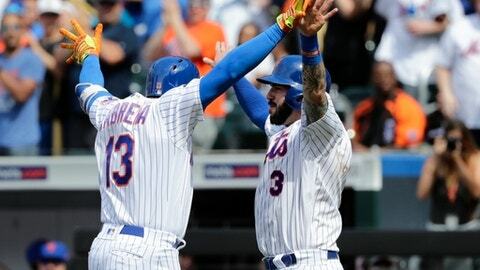 Rosario hit his first two home runs of the season and pinch-hitter Asdrubal Cabrera connected for a go-ahead drive , leading Noah Syndergaard and the Mets over the Arizona Diamondbacks 4-1 Sunday for a surprising sweep. The 22-year-old shortstop became the youngest Mets player to have a multihomer game since Lastings Milledge in 2007. The Mets hadn’t won back-to-back games in more than a month before rolling past the NL West leaders for their first three-game sweep at home since September 2016 vs. Minnesota. Arizona has lost four in a row and 10 of 11, scoring just 22 runs in that span. ”Everybody here is a victim of trying to do too much,” manager Torey Lovullo said. ”They care and I sense that, and I think they might be guilty of trying too hard. They want it so bad that we’re doing things in a pressing manner. I just want us to remember that we’re good when we’re ourselves,” he said. Pitching in the majors for the first time in over a year, Clay Buchholz blanked the Mets on one hit until Rosario led off the sixth with his first home run, tying it at 1. Cabrera batted for Syndergaard with two outs in the seventh and launched a two-run shot off Jorge De La Rosa (0-2). The crowd was still cheering when Rosario, batting ninth, sent a drive over the center-field wall for the first multihomer game of his big league career. Rosario made his debut last year to great fanfare, yet had shown only flashes of his talent. He was in an 0-for-12 rut that had dropped his batting average into the .230s before breaking loose. ”It feels amazing,” he said. Syndergaard (4-1) gave up one run, on a groundout, and struck out seven. The Diamondbacks often swung early – Syndergaard faced four batters in the fifth inning and threw a total of four pitches. Robert Gsellman got five outs for his first big league save. His only other pro save came in the rookie Gulf Coast League, soon after the Mets drafted him in 2011 at age 17. Buchholz was immediately pulled after Rosario’s tying homer, having thrown 61 pitches. A two-time All-Star with Boston, he tore a tendon in his right forearm while playing for Philadelphia against the Mets in April 2017 and missed the rest of the year. The 33-year-old Buchholz made five minor league starts for Kansas City and Arizona this season, then was promoted from Triple-A for this game. Buchholz constantly mixed his fastball, curve and changeup, striking out two and walking one. He was eager to get going after his long absence, too, often bounding out of the dugout and beating the rest of his new teammates onto the field. Arizona eked out a run in the second on Jeff Mathis‘ RBI grounder. Mets right fielder Jay Bruce threw out Mathis at the plate in the fifth when he tried to score from second on a single. The Diamondbacks optioned RHP Jimmie Sherfy to Triple-A Reno and transferred RHP Randall Delgado (oblique) to the 60-day disabled list to make room for Buchholz. It was a rare warm, sunny day at Citi Field after a recent spate of damp weather. Rain had been in the forecast, but not a drop fell. That helped the Diamondbacks play their 508th straight game with a postponement. They haven’t washed out since 2015 – having a dome at home helps, too. Diamondbacks: 3B Jake Lamb, who missed more than a month with a sprained shoulder before returning this weekend, probably won’t start all three games in the upcoming series at Milwaukee, Lovullo said. The team wants to give him proper rest. Diamondbacks: RHP Zack Greinke (3-2, 3.46 ERA) gets an extra day of rest before starting Monday night vs. RHP Chase Anderson (3-3, 3.97) at Milwaukee. Greinke is 16-3 at Miller Park, including a 15-0 stretch when he pitched for the Brewers. Mets: LHP Jason Vargas (0-3, 13.86) makes his first start since May 8 after being skipped in the rotation. He starts at home against Miami RHP Elieser Hernandez (0-0, 2.25).